Another day-late post, I'll catch up and be on top of posting later today with a second. 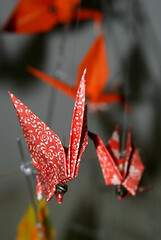 This is a crane mobile that my wife made, which hangs in our/her study. I think I captured the flock aspect fairly well for a shot at 10:45pm while heading to bed. heh.